The Jim Rowe 4-on-1 Exhibits are reminiscent of the styles of exhibits in the 30's. These were done up in 1977 and only 10 teams were featured. Each card a little bigger than 3" x 5" and features four of the team's star players from earlier days. 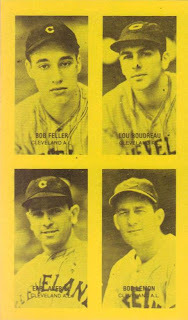 In the case of the Indians, we're talking about Earl Averill, Lou Boudreau, Bob Feller and Bob Lemon!